This 'farmhouse' is situated on the crest of a hill to the southeast of the traditional city centre of Pretoria. The topographical position of the site enables nearly 270° views to the west and the north, as well as in an easterly direction. The density of the vegetation of the lower-lying areas is such that one can pretend one is in a rural area, specifically during the day. These views, afforded by the context of the site, make it highly desirable. The uniqueness of the site and nostalgia for what was or could be within the exclusivity of this specific residential area could be considered as some of the driving forces for the design of the building. This nostalgia for the quintessential farmhouse also informed the choice of architectural form, plan typology, materials and tectonic expression. In order to deal with the specifics of site and the magnitude of the view from and to the site, the scale of the building in both plan and section is quite large. Forms, as well as detailing, are simple and robust. The chosen colours for the building underpin, in equal measure, the desire for a rural but perfectly controlled context. The garden design is furthermore also in the service of this idea of the house. This is specifically true of the garden area to the north. Here, the immaculately clipped, perfectly level, manicured and framed lawn is used to form a horizontal base for the view to and from the house. Nothing has been allowed to interfere with the perfection of this view. The attention to detail from the swimming pool to the staircase, to the upper level in the 'silo' to the shaping of the thick brick walls, to the solid wood roof trusses is impressive and obviously made to last beyond just a couple of generations. The house is massive and 'heavy' and it makes no apology for it. This quality has been retained in the interior- there is virtually no difference in the main materials used outside and inside, and as such there is also no display of the conventional notions of domesticity. In contrast, the delicate way in which a shadow line has been created where the floor of the covered stoep meets the lawn provides a wonderful relief. 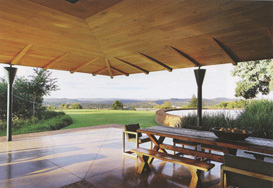 The same is true of the delicate manner in which the stoep's roof supports have been designed. It is as if this roof supports but does not support at the same time creating an intriguing reminder of the way that reality and the idea of gravity have been handled in the building. This testifies to a certain playfulness and 'lightness' in the design of the building, despite the intense seriousness and gravitas of this New Residence in Waterkloof. The memorability of this farmhouse, in all its thoughtfulness and refinement, is evident in the confidence and proudness of the manner in which it has been placed on the site, and how the site has been completed by its presence.